I have decided that I want to do a little decorating in my bathroom and I want to do it for as little money as possible. My bathroom is pretty small and doesn't have any natural light so getting photos is not the easiest. I have to do things like sit in the sink or stand in the bathtub to get any pictures. You may remember this basket. I first had it in my bedroom holding an old quilt. 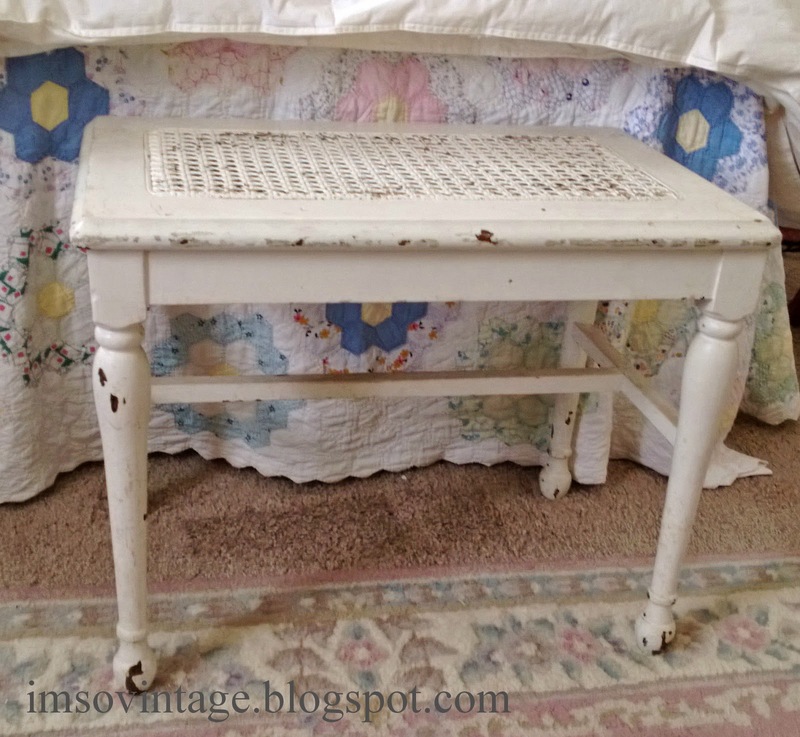 Then when I moved last year I decided to fill it with my vintage linens and set it on a chair near my bed. It was nice having the linens within easy reach, but I decided I wanted to be able to sit in the chair and I have done something new with the window they were sitting in front of. I will share that another time. So I have moved the basket to the bathroom. 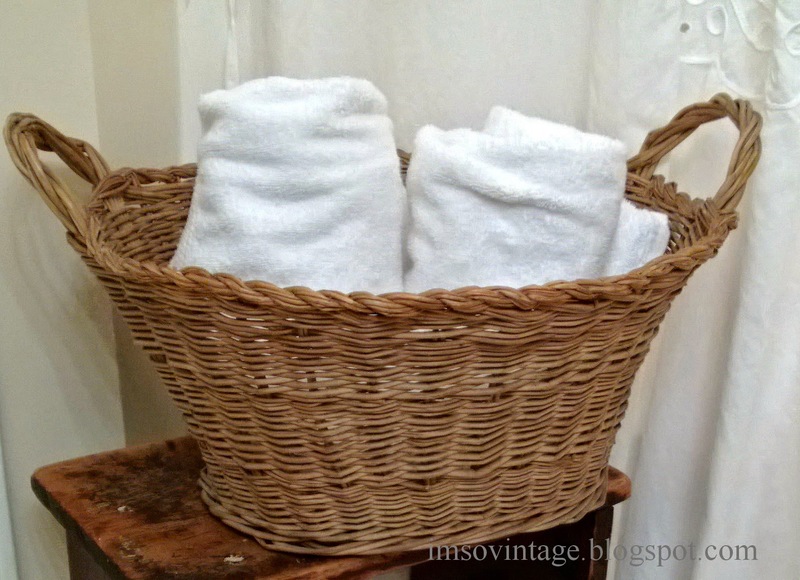 I wanted to have extra towels handy and the basket is the perfect size for that. I wasn't sure what to set it on, but then I remembered the old milking stool that used to sit at the foot of my bed. I replaced it with this white bench and since I didn't know what to do with the stool I stuck it out in the garage temporarily. It was the perfect size to set the basket on next to the shower. Since these were things I already had, this portion of the redo was free, including the pretty white shower curtain. I found it in my sister's rag bag. She had somehow gotten it stained really badly and as she, unlike me, just goes out and buys new, it was tossed. I rescued it. With some soaking in Biz and a couple of rounds of bleaching it was almost like new. Next week I'll show you what I have done with a great find from an estate sale. They were ready to toss it. Hello Laura, Oh I love these changes. Isn't it fun to rearrange and/or find a treasure someone else has tossed? 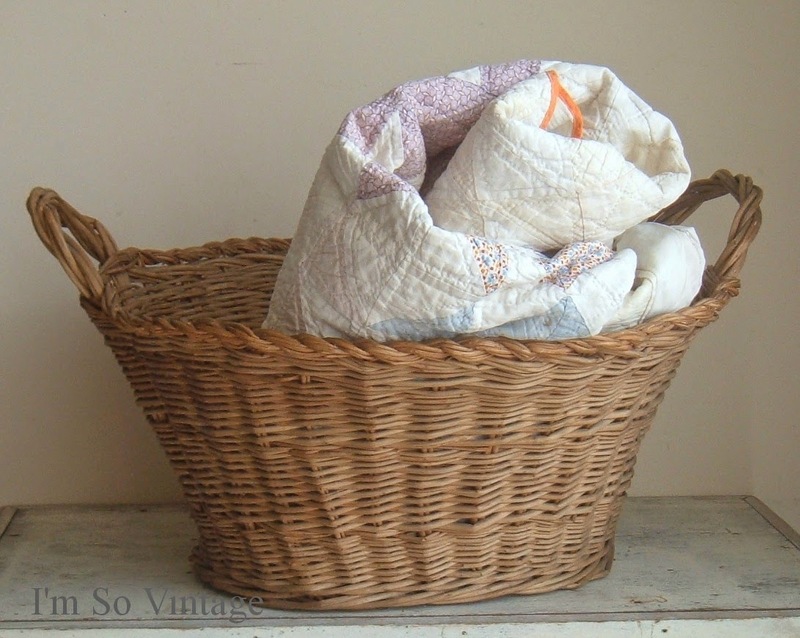 The milking stool is just right for the gorgeous basket with towels. The shower curtain looks great. That shower curtain looks like one I used to have - so pretty! 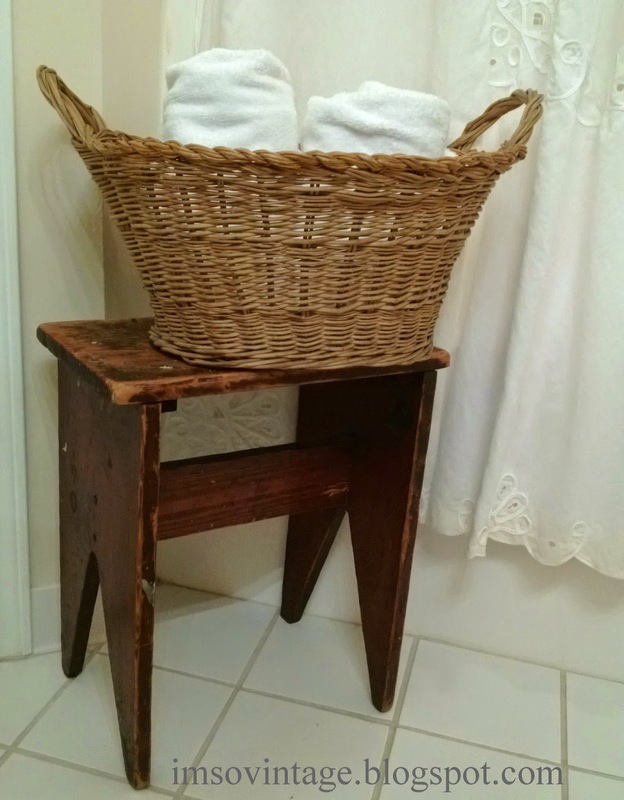 I like the stool and the basket in your bathroom. They add a nice touch! Love that basket wherever you chose to place it in your home, Laura! Your fresh white bathroom will be perfect for your Summer guests! I am always happy wherever I use the basket. It was a great auction find. 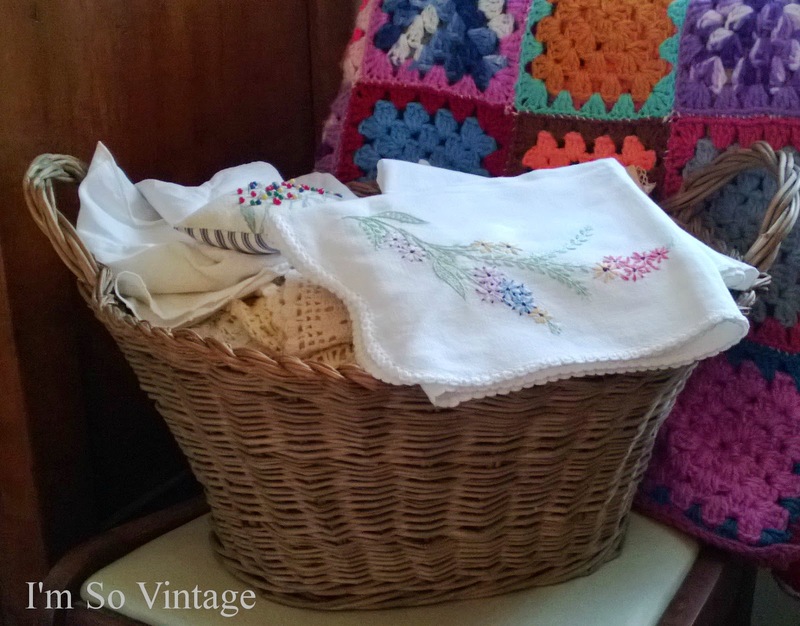 I love baskets and use them in every room. I'm moving a few things around in my house today....trying to freshen things up. I even took a trunk load of stuff to donate today! Happy weekend! Hugs! The shower curtain is so feminine and pretty. Definitely worth the extra work to get it cleaned! Love the benches too! Have a great weekend, sweet Laura! I got that bench at an auction. I fell in love with it as soon as I saw it. I love the basket filled with fluffy white towels next to the tub. And I love the white shower curtain. Your perseverance paid off in getting it clean! I'm looking forward to seeing what you do with that bathroom. I use a basket for towels in my bath as well. I also love the shower curtain! This looks so charming. I want to see more!! I have a bathroom that is just itching for a face lift. Come on down and help me. Great job, Laura. Your basket and stool were the perfect match. 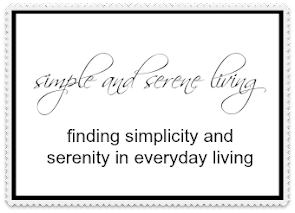 Simplicity personified!! Love the basket and stool together, great pairing! Great idea, Laura. Your guests will be impressed and find this handy. Amazing what some people throw out. We have become a throwaway society. Simply buy new and add to the landfill. Laura it looks perfect:) Great no cost spruce up.